DONALD TRUMP ran for office as an unabashed protectionist — it is one of the few political positions on which he never wavered — and hostility to free trade was a central message of his inaugural address. "We must protect our borders from the ravages of other countries making our products, stealing our companies, and destroying our jobs," he declared. "Protection will lead to great prosperity and strength. . . . We will follow two simple rules: buy American, and hire American." Cheering in the crowd as Trump spoke, reported Reuters, were numerous supporters wearing his signature "Make America Great Again" baseball caps — many of which were imported from China, Vietnam, and Bangladesh. Made-in-America Trump hats were available for purchase on the official Trump campaign website, where they sold for up to $30 apiece. But as Reuters noted, the imported versions being offered by street vendors in Washington cost only $20 — one-third less. What distinguished the cheering onlookers rocking a domestic "Make America Great Again" hat from those wearing an imported one? Only one thing: Those who bought the US-manufactured product for $30 ended up with $10 less of purchasing power than those who spent $20 to buy an import. Trump supporters whose caps came from overseas had money left over to spend on other purchases from other vendors. There, in a nutshell, is the folly of "Buy American." Of course, everyone who bought a cap did so voluntarily. Those who opted for the "100% American" style from Trump's website may have gladly paid the higher price. But protectionism deprives consumers of their right to choose. When "Buy American" is mandated by law, it forces individuals and businesses to spend more for goods and services than they otherwise would have had to. It leaves them with fewer resources, and fewer resources means less growth, less affluence, less investment. "Protection will lead to great prosperity," intoned Trump. But that's just what protection won't do. If Congress enacts Trump's protectionist proposals and makes "Buy American" mandatory, whether through higher quotas, import quotas, or procurement restrictions, what follows? The price of baseball caps — and sneakers and cellphones and cars and grapes and lumber — will rise. As a result, fewer people will buy baseball caps (sneakers/cellphones/cars/grapes/lumber). Or they'll buy them less often. Or they'll buy less of other merchandise — including merchandise made in America by American workers whose jobs will be endangered by declining sales. Protectionism amounts to the claim that everyone benefits when choices go down and prices go up. The only reason more Americans don't dismiss that claim as self-evident crackpottery is because it comes cloaked in the language of nationalistic resentment. Such as Trump denouncing "the ravages of other countries making our products" and urging patriots to support him in "rebuilding our country with American hands and American labor." 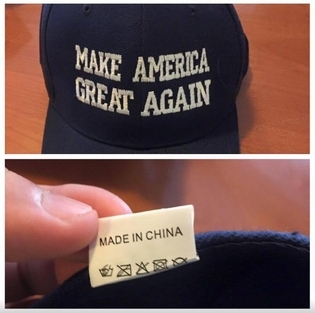 Not even Trump claims there is anything unpatriotic about selling American-made products to Mexico or China. So how can it be unpatriotic to buy products from Mexico or China? Trade is by definition a two-way proposition: Stifle imports and you stifle exports. The only way foreigners can acquire the dollars they need to purchase American goods and services is for Americans to buy their goods and services. The more we trade, the more we gain. Trade across borders — whether municipal, state, or national — expands opportunity and increases prosperity. It is no more "patriotic" for American consumers and manufacturers to restrict their economic activity to American soil than it would be for residents of a state to confine their spending to their own state. 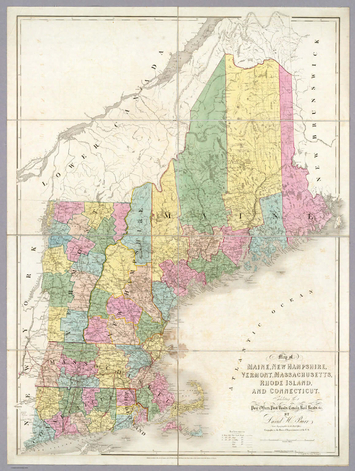 When people in Massachusetts do business with people in New Hampshire or New York or New Mexico, it isn't evidence of the Bay Staters' disloyalty or weak self-esteem. Everyone understands that Americans trade across state borders because it increases economic opportunity and improves our standard of living. Mandatory "Buy American" rules make no more sense for America than mandatory "Buy Massachusetts" rules would make for Massachusetts — or mandatory "Buy New Bedford" rules would make for New Bedford. Prosperity doesn't come from confining trade behind boundaries, but from expanding it beyond those boundaries. That's true of neighborhoods, cities, and states. It's no less true of countries. More than perhaps any previous president, Trump has done business around the world. He has invested, hired, purchased, and built in other countries. Hundreds of products sold by Trump were made overseas. On the website of his now-defunct Trump University, he explained how "outsourcing help[s] companies be more competitive and more productive." If anyone should understand how beneficial trade across borders can be, Trump should. Cynical protectionism may be good politics. But one thing it will never do is make America great again.